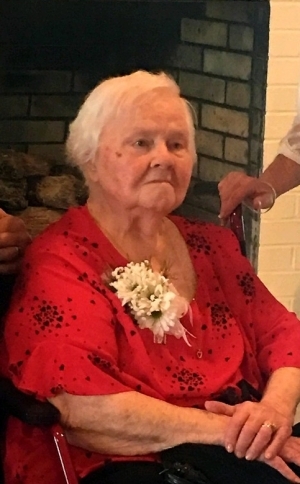 Myrtle A. Thomas, 89, entered eternal life on Thursday, March 21, 2019 at her home. She retired from Southern Indiana Rehabilitation Center. She loved her children and grandchildren unconditionally. Myrtle was preceded in death by her husband, Howard Roy Thomas, a brother, George Sweeney, Jr., and two sisters, Marie Heil and Mildred Hancock. Surviving are her sons, Kevin (Kelly) Thomas, Sellersburg, Mark (Margie) Thomas, Charlestown, daughter, Treasure Nichols, Sellersburg, brothers, Albert (Juanita) Sweeney, Henryville, Charles (Dorothy) Sweeney, Hawesville, Kentucky, sister, Martha Jane (Jimmy) Guthrie, Henryville, five grandchildren, nine great-grandchildren and nine great-great grandchildren. Funeral services will be held 11AM Monday at the Garr Funeral Home in Sellersburg with burial to follow at Mt. Zion Cemetery in Henryville. Visitation will be Sunday from 12-8PM and anytime after 9AM until the time of service on Monday. In lieu of flowers, memorial donations can be made to Norton Children’s Hospital, 231 E. Chestnut St., Louisville, Kentucky 40202 or Myrtle’s Caregivers who have gone above and beyond. Online condolences can be made at www.garrfuneralservices.com.